This conference will address how direct and indirect regulations impact startups, innovation, and disruptive technologies. Panelists will address this question along various industries such as smart mobility, financial technologies, and medical technologies, among others. In doing so, panelists will discuss a myriad of legal and regulatory issues such as venture capital funding and financing, labor regulations, immigration and foreign hires, patents, and privacy and data security regulations. The discussion will also touch on creating innovative policies and designing smart regulations and laws to better keep pace with our technological changes. Panels 1 and 2 have been approved for 1.5 credits of CLE each in the Areas of Professional Practice category (or a maximum total of 3.5 credits for those who stay for the whole day). This panel will explore the relationship between technological innovation, startups, regulations, and the law. Which factors impact the ability of startups to grow, innovate, and succeed? 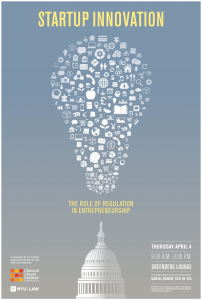 How do regulations and the law impact the ability of firms to raise capital in different sectors and industries? How do labor, financing and securities regulations alter the strategies and prospects of new firms? Are these obstacles the same in MedTech and FinTech? Given the recent development of regulations impacting ride hailing in New York City, this keynote discussion will address the various ways in which the prominent ride-sharing company Via is impacted by these new rules. The discussion will include the new ride-sharing cap on drivers, the minimum pay laws for drivers, and the state’s surcharge fees and congestion pricing plans. The discussion will also involve how to approach designing policies for ride hailing to address social concerns while maintaining the right incentives for ride sharing companies to continue innovating. New technology is moving faster than conventional laws and regulation can possibly move, and at times these rules conflict with technological developments. This panel will address the various ways in which regulations and policies can be innovated or designed to address better incentives for entrepreneurship and technology. Panelists will address these topics along industry lines and along various types of regulations such as labor, privacy, intellectual property, and financing and securities regulations.